The 55th Doe Show took place at the company’s Ulting, Essex headquarters in early February, attracting customers and visitors from all over the UK. David Williams reports. “We went into the show with a degree of trepidation as many of the exhibitors were not particularly enthused with the state of the market following their attendance at Lamma,” explained Ernest Doe & Sons Ltd sales director, Graham Parker. “However, we need not have worried as the sales figures so far, from our event, are just five per cent down on the 2014 show, which was the second best we have had so we are very pleased. We had good finance offers to help customers including ‘Buy now, pay next January’ on new New Holland tractors and we were also offering structured deals on combines which allowed those who were considering a combine purchase for last autumn, but had delayed their decision, to come back into the market and update their machines.”We sold more new machinery than used as a result of getting the finances and cash-flow right and a highlight for us this year was the amount of smaller equipment that was ordered, much of which was displayed inside, including bale wrap, tools and lubricants. It was a busy three days for those suppliers,” he added. “We also received many good enquiries regarding grain storage and handling for our buildings division, most of which are long-term projects.” The record-breaking New Holland CR10.90 combine, which took the world record during the 2014 harvest for the amount of grain harvested in 24 hours, was a star attraction and Graham said impressed visitors were seen throughout the show days stepping out the header to check its 41-foot width.Ernest Doe Power general sales manager Gerald Silvey said he was also surprised by the level of interest at the show; “Following the event, which was one of the best we have had for new tractor sales, I am confident that the early part of 2015 is going to be one of our busiest ever,” he said. “We had extended finance offers available on Case IH tractors at the show, which helped, but we were also very pleased with the level of interest in the Spearhead hedgecutter range, for which we took many orders, and the Farm Gem trailed and self-propelled sprayers were also proving popular. We are very optimistic that we will be seeing a busy season.””We had great feedback from exhibitors; they like coming here as they take orders which they can’t at most shows,” continued Graham. “It is a selling show, and our staff are here to sell. Often people visiting for the first time are surprised by the scale of the event, and arrive expecting it to be a typical dealer open day with just a few tractors displayed. We receive many e-mails after, complimenting us, which is very pleasing. We are proud of the event,” he added. Manitou’s new MLT960 telescopic handler is now in full production and had pride of place on the company’s stand, just inside the main entrance to the event. “It is ideally suited to farms in this area,” explained marketing manager Paul Bidwell. “It has a maximum lift capacity of 6t and maximum lift height of 9m and is designed to carry out demanding tasks such as grain handling and will also appeal to straw handling contractors. We expect a lot of interest from visitors to the show.” Paul is pictured (right) with area after sales manager Jason Davies. Marshall Trailers is a recent addition to the Ernest Doe list of franchises, the brand having been shown for the first time at the 2014 Doe Show. Since then the trailers have proved popular with the dealer’s customers, said Charles Marshall, pictured with one of the latest QM trailers displayed. “The new QM range is versatile, being a base-spec trailer supplied ready to accommodate future upgrades,” he said. 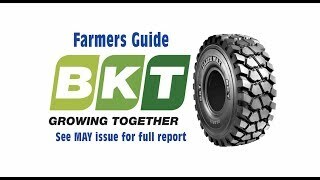 “Items such as air brakes, better lighting, a rollover cover, and hydraulic door safety valve can all be bolted on later; for example if a new tractor is purchased or if the farm’s needs change. This makes it cost-effective as it can meet future needs.” The QM specification includes trailers from 6-16.5t capacity, and the basic 16t grain trailer costs from 16,600. Bomford’s latest Hawk hedgecutter, available now with variable forward reach, was creating interest on the company’s stand. Variable forward reach was an option available previously only on the larger Falcon models, but its introduction for the Hawk range means it can be specified on mid-sized machines, with the convenience of 3-point linkage mounting. Prices start at 18,000 for the Hawk with the new option and it is suitable for use on tractors from 100-120hp and has 74hp available at the cutting head, said director of sales and marketing James Cuthbertson who is pictured (left) with area sales manager for the south-east Craig Whiting and service engineer Rhys Thomas. Graham said his first tractor sale was a Case IH 885XL 4wd tractor and his 1,500th was a Case IH Quadtrac. The 1,800th was a Puma 230 CVX supplied to Steward & Son of Dennington, Suffolk. “With the backing of Ernest Doe Power I can go out to farmers confident in the superb back-up available to them. Investment is continuing too, with a new workshop under construction at the branch. I didn’t dream 30 years ago that I would be selling rubber-tracked crawlers of 620hp priced at almost half a million pounds, but I am delighted with the way things have turned out,” he added. Pictured (l-r) David Redman, Graham Goodwin, Case IH business director Richard Beadman, Ernest Doe Power general sales manager Gerald Silvey, and Case IH marketing manager Charles Blessley. A new Germinator Pro cultivator was on the Kongskilde stand. The heavy-duty cultivator is available in 5.2, 6.2 and 7.9m working widths and has a hydraulic levelling board fitted as standard making it suitable for use even in very uneven conditions. Individual banks of cultivator tines provide accurate ground contour following. The pre-series versions operated successfully in the UK during 2014 with full availability in time for spring drilling this season. Also on the stand and being shown for the first time was a ‘Hog-chute’ option for the BS4500TC trailed bale shredder. “Previously the straw could only be blown out through the normal discharge chute,” explained area sales manager Mark Evans (right), who looks after the Ernest Doe account. “But we had demand from pig farmers for a means of spreading straw in pig arcs and this chute system allows them to do that. It has hydraulic adjustment and folding and adds approximately 1,100 to the cost.” Mark is pictured with product support manager Steve Mitchell. 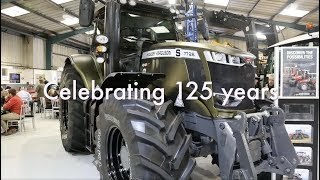 A large selection of used and ex-demonstration combines, tractors and other machinery was available to view during the show days and the special deals on offer attracted customers from throughout the UK. The Ritchie Stock-Cube is designed to allow livestock to be safely moved from pens to crushes and uses a sweeping system which avoids the need for staff to enter the movement areas. “Farmers like the ease of use, as moving the stock becomes a much calmer activity and is safer for staff and animals,” explained Ritchie area sales manager for the south-west Marcus Selway who is pictured with the system at the event. “We expected to sell 10-12 during the first year of availability but have already supplied 20-30 so we are delighted with its reception,” he said. Pictured with the Kuhn Axis 40.1 H-EMC fertiliser spreader is area sales manager Paul Gregory. The spreader is available with or without weigher and allows the rate control to be varied through each disc independently, using a hydraulic drive system to monitor torque loadings. It is compatible with Isobus-equipped tractors or with Kuhn’s own control box and it also allows GPS-controlled Optipoint switching and Vari Spread width control. Paul said that the spreader’s features have proved popular with Ernest Doe Power customers and a large number have already been supplied. “The increasing cost of fertiliser means farmers are keen to apply it accurately and only where needed, and the features of these spreaders provide very good accuracy,” he said. Also shown was a PTO-driven 40.1 M EMC spreader, which uses a mechanical- based torque monitoring system to monitor and adjust application rates. This is available at lower cost than the hydraulic-driven version but lacks the independent disc monitoring and control. It is in its first season of full availability following extensive testing last year. Pictured on the Dal-Bo stand are senior service engineer Karl Simms (left) and UK sales manager Steve Atkin with a new Maxiroll Lift, for over-seeding or new grass seeding. A choice of cracker board or levelling board is mounted at the front followed by two rows of 12mm sprung harrow tines. At the rear a 50 or 55cm Cross-combi press, or a 710mm ballast roller can be fitted. A pneumatic seeder unit distributes grass to the rear of the sprung tines for incorporation by the roller. The new 3m seeder costs 15,650. Also shown was a versatile stubble cultivator which fits to the front of a Maxiroll, designed to tackle the growing black-grass problem. Four rows of 16mm tines loosen the surface and allow trash to flow through and are followed immediately by a rear press to ensure seed to soil contact and moisture preservation. There is a choice of Cross-Combi or Cambridge roll-type presses and both options were displayed at the event. Steve explained that there has been considerable interest in the new cultivator, which can be supplied as a complete unit or fitted to any existing Maxiroll dating from 2008-onwards. Crop care solutions were generating most enquiries for the Martin Lishman staff at the show. The floor vent system, which offers cheap under-floor ventilation of stored crops, and which was introduced to the company’s range three years ago has proved popular as it has all the benefits of a pedestal system but allows fans to be located outside the building which means they can be switched on sooner and can start working before the store is filled. “With our floor vent system, air is drawn from inside the shed to outside which means heat is taken out of the building rather than recirculated and there is no forced air ventilation,” explained sales director Ian Clayton-Bailey, who is pictured (right) with sales manager Tom Barker. Tom added that other products which have seen high demand during the past year have been the Barn Owl Wireless storage monitoring system and the new low-cost mechanical grain level indicators for use in storage bins or silos and which allows the user to see, at a glance, the amount of product in the bin, from ground level. Weaving Machinery sales representative Carl Humphries (pictured) reported strong sales of the company’s Tine and Sabre Tine drills. “Heavy land farmers are looking for something capable of direct drilling when conditions are suitable, but which can also work within a conventional cultivations system. The Sabre Tine drill offers this and has been performing well for the past three seasons. We have sold a lot of 8m versions, across the UK, and the product has proved popular with Doe Power customers. We are busy building machines for delivery in time for spring drilling and, at the show, have had many enquiries from farmers keen to purchase new drills this year.” Pictured with one of the latest Case IH tractors are Fram Farmers machinery buyer Jemma Neesham, Case IH major accounts manager Andy Whiley (centre) and area sales manager, David Redman. Fram Farmers is a Suffolk-based farmers’ cooperative through which members benefit from making purchases through the buying group. Fram Farmers has a strong relationship with Case IH, with which it has worked for many years. “Case IH is a well-established brand with a good range of products which people like,” explained Jemma. “There has been considerable interest at the Doe Show and we have been busy throughout dealing with enquiries from farmers keen to find out about the advantages offered by our machinery purchase schemes.” Construction machinery is a major part of Ernest Doe’s business and was demonstrated throughout the three days. The Thwaites and Bomag franchises are relatively new to the dealer, but sales have been so good that the area within which the company represents the brands has already been extended. The Spearhead sales area was busy and sales manager James Brown reported a good first day which had included orders placed at the event. “Our full range of products sells well through all the Ernest Doe Power branches,” he explained. “We saw a big increase in sales, particularly of flails and rotary mowers and with the level of interest here at the show, we expect many more sales to result. The new 545 and 595 hedge cutters, which are entry-level machines, were announced during 2014 and are in their first season of full availability but have proved especially popular,” he added. James (left) and service engineer Ian Haines are pictured with the new Pilot control multi-function joystick which was making its first public appearance at the event. It is standard for 2015-model mid-range Twiga models and above and replaces the previous standard hydraulic controller. Extra features include a fully-adjustable dedicated armrest and operation of telescopic arm and power slew are included on the joystick. On the Lely stand the 280PC trailed mower, which has been launched for the coming season, was attracting interest. Replacing the 281PC it has a 2.8m cutting width and is designed for demanding work environments. It has the new ‘Q3’ cutting bed, which shares design features with the existing ‘Q2’ bed, but is bigger and stronger. A conditioner is standard and steel flails are fitted, but a steel roller conditioner is available as an option. Ground operating pressure is set hydraulically and is infinitely variable to suit the conditions. Drive is from the PTO through a headstock-mounted gearbox, which means the PTO shaft remains straight even during tight turns. The price is 16,650. Pictured with the new mower are Lely area sales manager Jonathan Coleclough (left) and Ernest Doe Power area sales manager based at Hurst Green, Sussex, Ross Leech. Husqvarna business development manager Gary Philpott (left)and commercial support representative for the south James Walker are pictured with some of the petrol and battery-powered chainsaws being demonstrated at the event. “There has been huge interest in our battery saws,” explained Gary, “as their ease of use appeals. They won’t replace the larger saws but for smaller tasks they are ideal. They are quiet, so can be used at any time without annoying others, and very convenient. A typical 14-inch saw with two batteries and a quick charger, equivalent to a 35cc petrol model, costs approximately 725. New Holland’s latest flagship combine, the CR10.90 broke the world record for grain harvesting during the 2014 harvest and was displayed at the Doe Show. It was one of the star attractions at the event, attended by many potential customers, and Ernest Doe sales staff were busy dealing with enquiries and accepting requests for demonstrations. Pictured with the CR10.90 are (l-r) area sales manager for Braintree area, Andrew Leek; precision farming specialist Paul Jewell; managing director Colin Doe; area sales manager at Bennington, Robin Bourne; service manager for Colchester, John Miller; sales director Graham Parker; agricultural service manager-Ulting, Alan Van de Merwe and branch manager- Benington, Ian Roberts.